For many people, antibiotics have become a standard routine when they get sick. Since the 1940s, these drugs have significantly reduced illness and death from bacterial infections. However, they are not the go-to fix for everything. Conditions such as a sore throat or bronchitis are usually caused by a virus and cannot be treated with antibiotics. Nonetheless, the medical industry keeps prescribing these drugs to treat non-bacterial infections. As a result, bacteria adapt themselves to these drugs and become resistant. When this happens, a common, easily treatable disease may become an unstable killer. In fact, if we don't stop the overuse of antibiotics, bacteria may evolve to a point where even the last-resort treatments will fail. 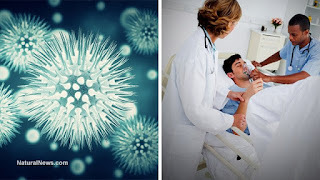 According to the Centers for Disease Control and Prevention (CDC), at least 23,000 American people die each year as a direct result of these unstoppable infections. Long before Alexander Fleming discovered antibiotics in 1927, our ancestors relied on medicinal plants and natural remedies to strengthen their immune systems and prevent or cure infections. Some of these natural practices are still in use today. Turmeric, the bright yellow-orange colored spice that most of us know from Indian curries, has been well known and documented for its antimicrobial and anti-inflammatory properties. It inhibits the growth of certain bacteria, parasites and fungi. It has successfully been used to fight Helicobacter pylori, the bacteria that causes ulcers and gastritis. It can be taken as a supplement, drunk as tea or mixed with honey to create a skin-, wound- and infection-healing paste. Another excellent and versatile antibiotic is garlic, which has been shown to protect the body by killing harmful bacteria. Clinical tests suggest that garlic may be as potent as some of the commonly used antibiotics.